The client is the Swiss IT company developing software for automotive industry clients. The project is a car auction platform where B2B clients can either sell their cars directly or enlarge a car fleet with cars placed for bidding. 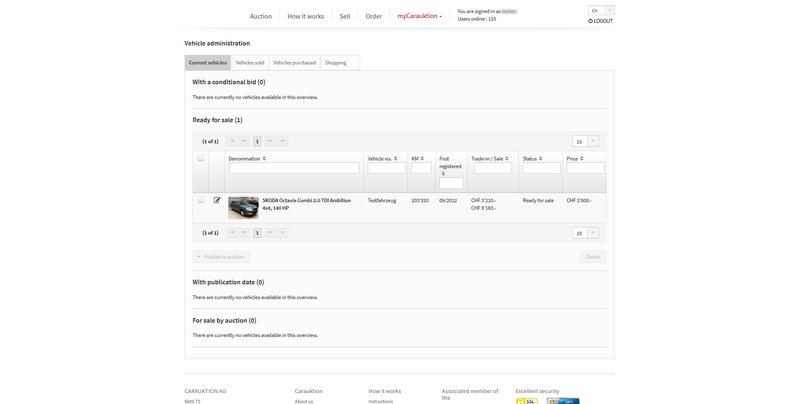 Each user goes through a registration process where they fill in the record providing exhaustive information about their lot – technical condition, mileage, the date of production – and add photos, set the minimum price for bid and other technical data. Premium clients can place an order on the platform and their record is further processed by an administrator who completes the profile of the lot according to the results of technical expertise. The auctions are held twice a week on Monday and on Wednesday and last for a day. The users bid for the minimum price of the car till the highest bid is reached. Once the goal is achieved, it guarantees that the auction will be closed, and the highest bidder becomes a buyer of the lot. In other cases, each separate bid is considered individually and the final decision is made by the owner. After the auction ends, the lifecycle of the article is not over. That’s where the back office steps in to complete the transaction. Let’s take a look at the after-sale order processing. Once the deal is closed, the lot is processed in the backend by the administrator. The backend part has a business-like design with a number of stages that admin adds the services which may include capture, transportation, vehicle check-in, insurance, provision, etc. which make the final order. Adding various features, APIs and changes on the user side and in the backend that allowed extending the list of services. Stress testing and existing services optimization. Maintenance of the services and applications. Technical support in services promotion and back office solutions. Elinext has reached the high level of the integration with the client’s business processes and paid special attention to the individual needs which ensured the successful solution of the operational and strategic tasks. This allowed our team to become the main development center for the client.